The total resource for the financial year 2015-16 is estimated to be about Nu 41B. 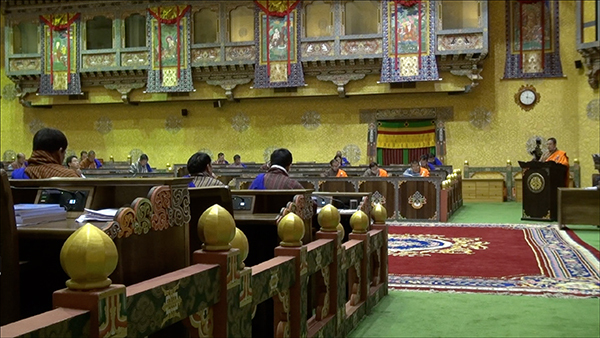 The finance minister, Namgay Dorji presented the national budget report in National Assembly, today. The government will be able to finance around Nu 2.2B of its capital expenditure from its domestic revenue. After meeting its current expenditure, the government will be left with Nu 2.2B that can be utilized in capital expenses. Of the total budget outlay of Nu 41B, domestic revenue constitutes Nu 26B and an external grant of close to Nu15B. As per the report, the domestic revenue is expected to increase by 5 percent over the previous year. The increase is mainly expected from the corporate income tax and dividends generated from the Dagachhu Hydro Power Plant, Bhutan Power Corporation and from the expected surplus transfer of Nu 200M from the Royal Monetary Authority. However, the report reflects that the growth may be affected if Dungsam Cement Corporation continues to incur loss. The report also reflects an estimation of 33 percent increase in the external grant. The government of India remains the largest development partner providing a grant of over Nu 11B representing about 76 percent of the total grant. While the estimated external borrowing is projected to over Nu 3B of which over Nu 1B is from the Asian Development Bank for the project-tied assistance. From the projected budget outlay, the general public services sector will receive the highest allocation of over Nu 9B which constitutes over 19 percent of the total projection. Education sector will receive the second highest allocation of 18 percent. The budget report will be deliberated in the parliament on June 8-9 9 after the finance committee reviews the report.